These two lovely creations were made for the care group cook out we had at our house this weekend! We had a baked potato bar and roasted corn on the cob so I thought these two desserts would be fun to go along with the meal! 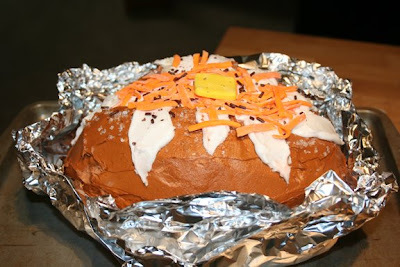 The baked potato is white cake baked in an egg shaped pan, covered in vanilla buttercream (colored brown). The "potato" part coming out of the top is extra cake, crumbled up. The cheese and the butter are both fondant, the pepper is crushed up chocolate sprinkles and the salt is sanding sugar! This cake was super fun and VERY easy to make! I did it all in about 3 hours! 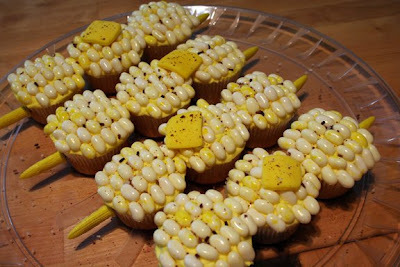 The cob-cupcakes are white cake with popcorn flavored jelly beans placed on top. I tinted the icing yellow before I placed the jelly beans on so that it would look a little more realistic. The butter is fondant and of course, the pepper is is crushed up chocolate sprinkles. I added the corn on the cob skewers as a fun twist! These have been done before by many, this is just my version! I loved both of them. The baked potato was very delicious. Great job! So cute. I love the corn! Wow...You are VERY talented! All of those cakes are ADORABLE!!! !